The group stage of Copa América 2015 was completed on Sunday night, with Brazil’s 2-1 victory confirming their place in the last eight of the competition. Mexico, Ecuador, Jamaica and Venezuela have all been eliminated, so here’s how we’re shaping up in the quarterfinals. The draw of the round sees pre-tournament favourites Argentina take on World Cup 2014 quarterfinalists Colombia in Viña del Mar. Lionel Messi’s men have been handed a tricky tie after their upcoming opponents squeezed through Group C by a solitary point at the expense of Venezuela. Los Cafeteros stuttered to a goalless draw in their decisive group game against Peru and were forced to wait until Brazil beat La Vinotino before celebrating progression; it was nearly a very embarrassing early exit for their ‘golden generation’. In truth, Pékerman’s side aren’t looking too threatening at all right now. The team, which boats a wealth of attacking talent such as Radamel Falcao, James Rodríguez, Teó Gutierrez, Jackson Martínez, Juan Cuadrado and Carlos Bacca (albeit now suspended) to choose from, scored just once in the group stage. A staggering statistic with the talent available. An upset in game at the hands of Venezuela came as a huge shock but Colombia appeared to have re-found their form with a strong display against Brazil. However, another drab performance against Peru was a step backwards and Pékerman was forced to ask the fans for patience at the final whistle. As Colombia’s dodgy form continued, it was Brazil who eventually topped Group C and proved there was life without Neymar. Brazil defender Thiago Silva, who was overlooked for the armband by head coach Dunga despite the absence of their star man, scored the opener in Santiago to put his side in control after just nine minutes. Roberto Firmino put the Seleção two ahead soon after half-time, and despite Miku’s headed goal late on, the eight-time winners made it through the group. They’ve been rewarded with a tie against 2011 runners-up Paraguay in the next round. La Albirroja have already proved their no pushovers after coming from behind in game one against Argentina to draw 2-2 and manager Ramón Díaz says his side, ranked 85th in the world, have proved their doubters wrong by making it through Group B unbeaten. Dunga, too, acknowledged the difficultly of the task ahead, insisting: “Paraguay are a strong team with a very tactical coach,” he told the media in a press conference. On the other side of the draw, Group A winners Chile must feel their place in the final is assured. La Roja must first surpass defending champions Uruguay in their national stadium but will meet either Bolivia or Peru in the semifinals. As host nation, this draw will have brought a much-needed smile to the face of Jorge Sampaoli as he looks to better his country’s four second-places finishes in the Copa. Reigning champions La Caleste may have won this tournament 14-times but without Luis Suárez, still suspended from international duty for biting Georgio Chiellini at the World Cup, Óscar Tábarez is lacking the necessary creativity in attack. Edinson Cavani is a goal scorer and holds a decent international record with 27 goals in 72 appearances but he needs to be supplied with chances – and often many. The threat La Roja pose with Sánchez and Vidal is very real and Uruguay will be lamenting the injury to defender Martín Cáceres at the back. The Juventus man had built a strong partnership with Diego Godin at the heart of the defence but is missing due to an ankle injury. In the other last-eight encounter, bewildering Bolivia take on Peru’s persistence. Mauricio Soria’s men have blown hot and cold throughout this tournament, with their decisive first-half display against Ecuador surely the most confusing of all. La Verde scored three goals in 45 minutes in that game but have looked a team short on ideas and talent for the majority of the competition. Peru head coach Ricardo Gareca is an astute manager and knows how to get the best out of a transitioning squad. Despite having only taken charge in February, the former Vélez boss has performed minor miracles to lead Peru out of Group C in second place. Los Incas arguably could (and should) have finished even higher, had it not been for the supreme pass from Neymar that set up a stoppage time winner in game one. Gareca will have his hide well organised and the threat of Guerrero, Farfán and Pizarro should be too much for their altitude-favouring opponents. As the group stage comes to a close, four teams will play no further part in the tournament. The understrength Mexico side, whose heart was never truly in the competition, were first to depart. Whatever Miguel Herrera insists, he did name a B-team for this year’s Copa, as the 2015 Gold Cup took his priority. But we’ll always have the memories, and Mexico’s 0-0 draw with Bolivia has been scarred into my brain for eternity. Ecuador were also eliminated from Group A. They showed spirit and determination to claw two goals back against Bolivia but they simply weren’t inventive enough going forward. Enner Valencia was often left isolated but Gustavo Quinteros can take some consolation from their final group game display. Jamaica also drop out. 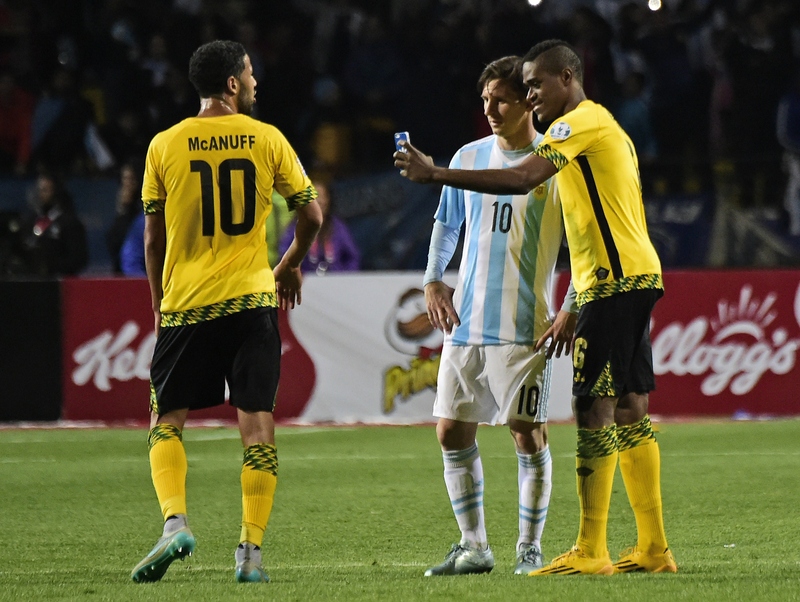 The Reggae Boyz certainly didn’t embarrass themselves (apart from that full-time selfie) losing all three games by a solitary goal. However, the odds were stacked against them from the start as they were drawn in the clichéd Group of Death. And finally Venezuela; their surprise 1-0 victory over Colombia resulted in four teams in Group C heading into the final round of fixtures level on points and they were the unluckiest of the four sides not to progress. Liverpool target Salomón Rondón showed off his considerable talent up-front but the Zenit forward couldn’t do it all on his own. There’s much more to come from the tournament and I think a Chile v Argentina final on June 4 is not only the best possible outcome from this quarterfinal draw – it’s also the most likely.